One of Olivier Vernon's teammates doesn't believe his hit on Marcus Mariota was dirty. Sunday's dominant win over the Tennessee Titans didn't come without some controversy for the Miami Dolphins. 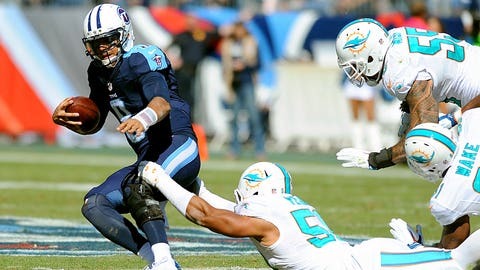 Defensive end Olivier Vernon has been accused of hitting Marcus Mariota low in what's been deemed by some as a dirty play. Vernon has come out and said that he never intended to hurt anyone and hopes Mariota recovers soon after being diagnosed with a Grade 2 MCL sprain. He insists it wasn't a dirty hit, and now he has a teammate coming to his defense, too. “I think it’s something that’s overblown,” Wake said on the Rich Eisen Show, via the Palm Beach Post. “We get cut-blocked, all those kind of things that happen to us, I mean, our knees are just as important as any quarterback’s knees. Our families are supported by us and the things that we do. We care about our well-being and our health just as much as a quarterback. Vernon wasn't flagged for the hit, but it's conceivable that he'll be fined for it in the coming weeks. The fact that Mariota sustained an MCL sprain also doesn't bode well for Vernon's chances of not being fined. Wake, who recorded four sacks on Sunday, also discussed current head coach Dan Campbell, and former defensive coordinator Kevin Coyle. For Wake, he doesn't see any reason why Campbell can't remain the head coach beyond this season, saying “why not.” As for Coyle, Wake came to his defense — sort of. “Speaking about coach Coyle, I don’t think he was out there missing any sacks, missing any tackles. We were the ones out there on the field,” Wake said.